Compression socks and stockings are an effective countermeasure against the development and/or spread of varicose veins. All styles of TXG graduated compression socks are suitable for varicose veins treatment and prevention. The level of compression you require will depend on your condition, so always refer to our compression guides or check with your doctor to see what compression level is best for you. Keep reading to find out more about what causes the condition, how it’s treated and why TXG compression products could offer you the perfect graduated compression socks or stockings for your varicose veins. Varicose veins are created when blood in your veins struggles to flow back to your heart (against gravity) from your lower limbs because the leaflet valves in the veins in these areas are weak or damaged. These veins should be opening in the direction of blood flow before closing again immediately afterwards, but in some cases they can fail to do so and lose elasticity and stretch, allowing some blood to pool, enlarging the veins and become varicose. As this blood is deoxygenated, it appears as dark blue or purple lines on the skin’s surface. It’s common for pregnant women to develop varicose veins during the nine months where they circulate increased blood around their body to support their growing child. Age also leads to weakened valves, and if you’re overweight and inactive or have a family history of varicose veins, you have a good chance of developing them. In most cases, varicose veins are just unsightly, but they can develop into painful ulcers on the skin above the affected veins, creating permanent skin discolouration, burst veins and in very severe cases, blood clotting. Varicose veins are usually harmless but can make you feel self-conscious about revealing your legs, impacting your self-esteem. If the reason for your varicose veins isn’t temporary (such as pregnancy), you should consider long-term ways for preventing them from occurring and worsening, rather than leave them unattended and run the risk of a more severe condition developing. With our modern stocking and sock designs, no one will ever know that you’re wearing compression wear. "They are great, stopped my legs from swelling and helped with my bad knee. I will always wear them now." "I've been doing an Alpine tramp over Cascade Saddle in Aspiring National Park & I wore the TXG compression socks. They are great. Stopped my legs from swelling and helped with my bad knee. I endured no lactose build up in my calf muscles despite the very steep ascent and descent. I will always wear them now and have recommended them to my tramping friends." "After a long shift, my legs didn’t swell or even feel sore." 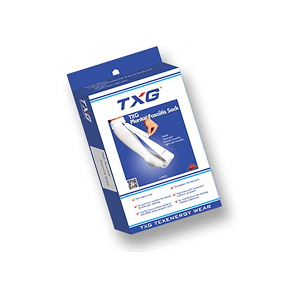 "After me being on my feet for 24 hours and wearing the TXG compression socks for that length of time; my legs didn’t swell or even feel sore. I wasn’t as physically tired either as I usually would be after working a 12-hour shift at the hospital. The socks are wonderful and far exceeded my expectations." "I love my arm and calf sleeves, they help me at hockey"
"I purchased some arm sleeves and calf sleeves and love them. Trialled them out last week during my many games of hockey and at an Ultimate Frisbee Tournament to see if they’ll help me at my next hockey tournament and I can safely say yes, I especially love the arm sleeves keeping my forearms from tightening which is so important when dribbling. They also help at the gym during any arm work where I grip tightly and my forearms tighten. Usually, I would fatigue and be forced to stop, but I get far more out of my arms." "I am able to stand longer during the day and I am less tired at the end of the day." "Before I started wearing them I would notice that I had a varicose vein that would stand out on my lower leg. I wear my socks all day and at the end of the day when I take them off, there is no vein standing out on my leg. The spider veins are still there but even those are less prominent too I am able to stand longer during the day as well. They are probably one of the best things I have bought."